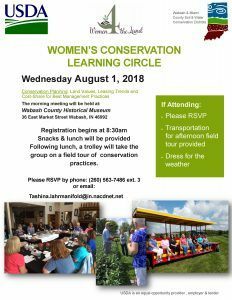 To reach the growing number of women landowners interested in farming practices that benefit the health of their land, Wabash & Miami County Soil & Water Conservation Districts along with Women4theLand are hosting a free conservation discussion and field tour for women farmland owners on AUGUST 1st AT THE Wabash County Museum at 36 E Market St, Wabash, IN 46992. This Women’s Conservation Learning Circle will bring together landowners in an informal learning format for a women-only morning discussion followed by lunch and a tour to view on-farm practices that promote healthy soil. Female conservation professionals will be on hand to answer questions and share resources. The key topic of discussion will be general soil health, management practices and government cost-share programs. The meeting is presented in partnership with the Wabash and Miami County SWCD’s along with Women4theLand. The learning circles method of conservation outreach to women farmland owners and the activities used were developed by Women, Food and Agriculture Network for its Women Caring for the LandSM program. On Wednesday, August 1st, coffee and registration will begin at 8:30a.m. and the meeting will begin at 9:00am. Lunch is provided, and the program will end at 3:00 p.m. Interested women landowners MUST RSVP by July 20th to the Wabash County SWCD by emailing Tashina.lahrmanifold@in.nacdnet.net or calling (260) 563-7486, extension 3. If you need accommodations, please notify us when you RSVP. Feel free to bring a friend or family member — just let us know when you RSVP!